Hottest State In The US During Summer? If You Guess Arizona - Guess Again! The Answer To This Question Will Surprise You – What’s The Hottest State In The US? Are You Thinking Arizona Is The Hottest State In The United States? Ever wonder which state was the hottest state in the United States? Probably not. Why would you? But if you have an inquiring mind and like trivia, here is an interesting bit of information. Now if you live in Southern Arizona, you know it gets hot during the summer. But is it hot enough to make Arizona the hottest state in the U.S. during the summer? Maybe-Maybe Not! How Do We Know What The Hottest States Are? 24/7 Wall St., is a financial news and opinion company. It delivers content over the Internet. And unless you are looking for them you won’t know who they are. The company publishes over 30 articles per day. And has readers throughout North America, Asia, the Middle East, and Africa. To be clear, it is not the Wall Street Journal. The study examined the average temperatures in each states for June, July, and August. The hottest months of the year. Then they ranked the hottest states from highest to lowest temperatures. And guess what? Arizona isn’t the hottest state in the U.S. It didn’t even make the top 10 hottest states. OMG! Who would have guessed it? Arizona is big and has large changes in elevation throughout the state. And as with most things there are pros and cons about living in Arizona. Yuma, in the southwest corner of Arizona, is at 141 feet about sea level. Now summer in Yuma is HOT! 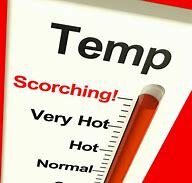 The average summer highs range from 110 to 120 degrees. Tucson is at 2400 feet above sea level. Its weather is cooler than Yuma. And Phoenix, 90 miles north of Tucson is at 1,086 feet. They call it the valley of the sun for a reason. And now lets go farther north. Flagstaff is at 6,900 feet above sea level. Higher then Denver! The higher elevations mean summer temperatures are cooler. In Flagstaff, much cooler. What are the hottest Arizona cities in the summer? Lake Havasu City, Peoria, Suprise, Yuma, and Phoenix are top candidates. With summer high temperatures in Phoenix range from 108 to 118 degrees. Tucson is 90 miles south of Phoenix, but is 1400 feet higher in elevation. Average summer highs in Tucson will be 5 to 10 degrees cooler than Phoenix. And Mt. Lemmon at 9,200 Feet above sea level. It is an hour away from central Tucson. Very cool in summer. Averaging all the highs and lows for Arizona cities made it the 11th hottest state in the US. Only the 11th Hottest State In The US. How Could That Be? Arizona’s average summer temperature is a nice 77.3 degrees. Note “average”. Phoenix weather makes it one of the summer hot spots in Arizona. Flagstaff is one of the coolest northern cities. Bottom line, the changes in elevation throughout Arizona make the average summer temps more moderate. Although not in the top 10 hottest states, Arizona is home to summer’s hottest spot in America. Lake Havasu City! Average summer temperature of 94.6 degrees. That’s average! Daily summer highs push 110 Degrees. And remember this. Arizona weather varies a lot depending or where you live. Or want to live. So what were the top 10 hottest states? The top hot spot goes to Texas. True! But it’s enough to top the nation in summer heat. Now here is a caveat for weather wonks. That 81.3 number is an average of the highs and lows over the summer months rather than a typical high for a summer day. You might not do it that way, but lets go with it, OK? Right behind Texas is Louisiana At 81.1 degrees. Again, not what you would guess for blazing summers. Getting the bronze (no pun intended) is Florida at 80.5. There you have it. And if you thought Arizona was going to be at the top of the list of hottest states, thing again. But perhaps it should be at the top of your list of great places to live or retire too! And if you do, give us a call. We would love to tell you why we thing Tucson AZ is the perfect place in Arizona. Why? We want you to know what to expect. And what to plan for. That includes understanding Arizona isn’t the hottest state in the US, but Tucson is cooler. Why? Elevation!